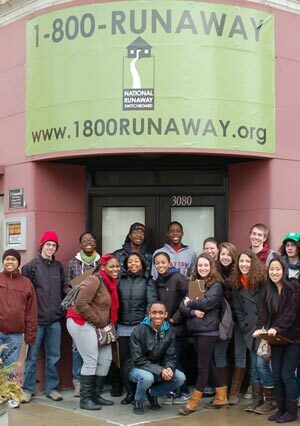 The National Runaway Switchboard (NRS) has been assisting youth and families since 1971. Calling our 24-hour, toll-free and confidential hotline or visiting our website (to communicate with liners via live chat, send crisis emails, or post to a bulletin board) helps thousands of families reopen the lines of communication, work through their difficulties and explore their options. For youth who have already run, we take steps to ensure their safety and support them in developing an action plan for the future. If youth want to return home, we can arrange that, too, free of charge, through our Home Free program. Street Team: Street Team members nation-wide are responsible for getting out the word of 1-800-RUNAWAY to those who may be at-risk. Street Team members are the front-line outreach arm of the National Runaway Switchboard. We know there are many teens and families in crisis who don't know about NRS� services. Street Team members help get the word out about 1-800-RUNAWAY by handing out NRS� many free promotional materials in the community. Materials include NRS� runaway prevention curriculum and video, brochures, bookmarks, wallet cards and posters. Street Team members can hand out or leave materials in schools, churches, libraries, stores, restaurants, mall, etc. - anywhere where youth or parents will see them. Step One: Attend an orientation session, an informational meeting that allows you to learn about the history of NRS, the services provided to youth and families across the country and the training process. Step Two: Interview with the volunteer coordinator and determine if NRS is a good fit for both parties. Step Three: Participate in the 40 hour training program which teaches you to effectively handle calls on the crisis hotline. You will be trained to use a five-step, solution focused crisis intervention model with each caller. The comprehensive training includes interactive instruction and discussion, role playing, listening in and supervised call sessions. After completion of training, liners are asked to make a one year commitment of at least 2-4 hours per week. Becoming a Liner requires a minimum age of 16, a 40-hour training session, and a one-year commitment of at least 2-4 hours per week.